Jewelry has been a staple of Native American culture for thousands of years. Tribes like the Navajo, Zuni, Hopi, and Santo Domingo are universally lauded for their extraordinary skill and finesse, not to mention the iconic and timeless designs. These days, there is a great deal of fake Native American jewelry out there, so it is important to be cautious as you plan your purchase. Fortunately, there are steps that you can take to protect yourself from devious sellers, and one of the most important steps is acquiring the knowledge to identify authentic pieces. An honest seller will proudly proclaim the authenticity of the piece in question. If the piece was crafted by a particular renowned artist, the piece will typically be stamped with the hallmark of its creator. Even if the piece appears to be stamped with the artist’s name or signature, don’t just assume that it is authentic. Some counterfeiters sell mass-produced jewelry with the same hallmark included. Each piece just includes a detailed description that states where the piece was sourced and which artist made it. If you’re making a sizable investment with the understanding that the jewelry is authentic, make sure to ask for a certificate of authenticity. While there may be some crossover depending on an artist’s unique approach, each tribe tends to have its own specific designs and styles. 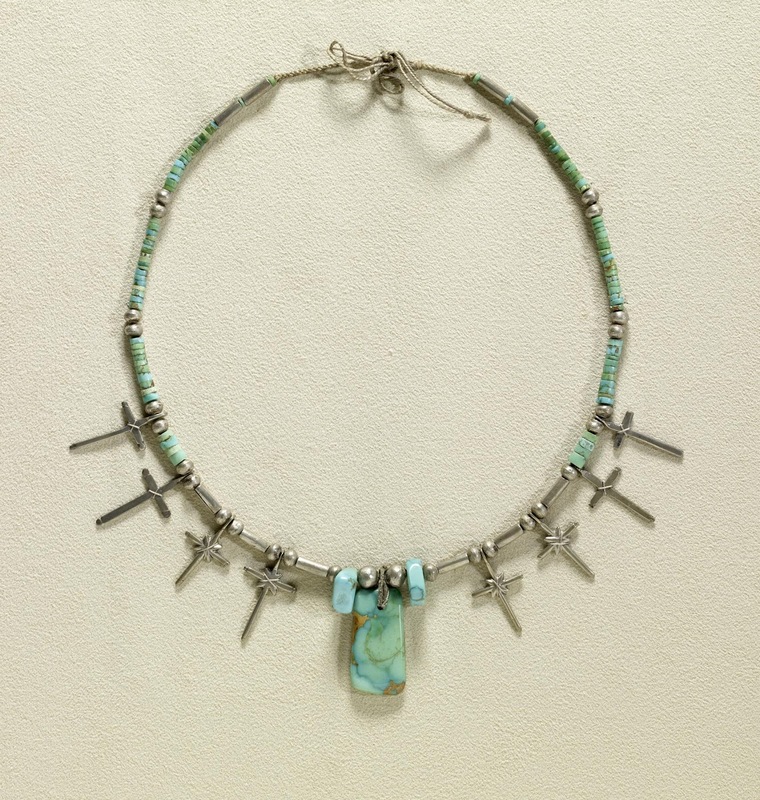 The Navajo tribe is known for using large stones (especially turquoise) and large silver settings for their bold jewelry. The Zuni tribe tends to use small stones in intricate clusters. Hope jewelry is usually completely silver with an overlay and oxidized bottom. The Santo Domingo tribe is most famously known for using flat, finely sliced beads called height. The Cherokee tribe is known for its longstanding and widespread use of copper. Recognizing the intricacies and subtle nuances of each tribe’s approach is going to make you a much more informed buyer. 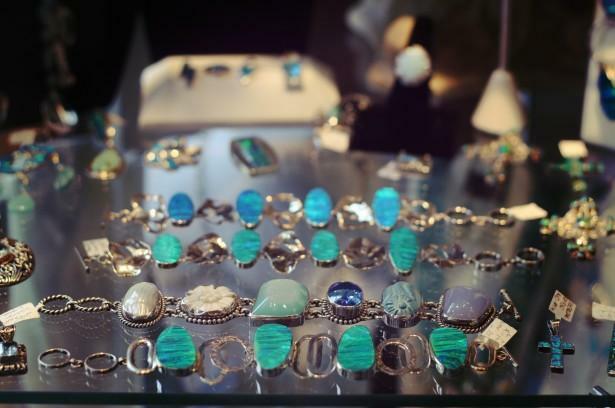 Fake turquoise is a big problem in the jewelry industry these days, so don’t buy turquoise jewelry unless you are confident that it is, in fact, genuine. Legitimate Native American jewelry is crafted using high-quality materials such as sterling silver and authentic turquoise, as well as precious and semi-precious stones, bone, shell, clay, copper, gold, and many others. If you are handling the jewelry at a brick-and-mortar store, examine it carefully to see if it feels like real metal and stone or if it is shoddily made plastic or other weak materials. Often fake Native American jewelry just feels like it could fall apart easily, so trust your instincts if something doesn’t feel right. Genuine silver and stone should have a bit of weight to it. One easy way to tell if a piece is made from genuine silver is to hold a magnet up to it. Real sterling silver does not magnetize. You should also inquire about the turquoise. 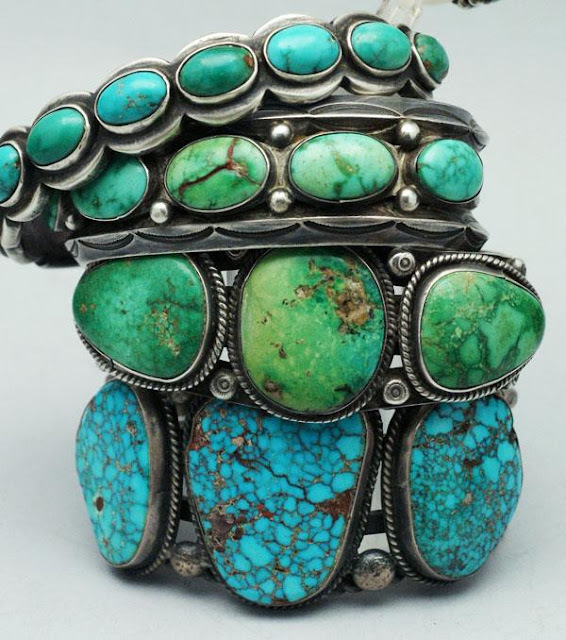 By law, the seller must disclose whether the turquoise is natural or stabilized (treated), with natural being the rarer and more desirable choice. It is worth noting that natural turquoise makes up only 10% of the turquoise available on today’s market, and treated turquoise is not necessarily a bad thing. Just make sure you are aware that a piece is treated as paying natural prices. One easy way to tell if a piece is counterfeit is if it is priced significantly lower than other similar pieces. Of course, there are deceptive sellers out there who will try to sell fake Native American jewelry at the same price point as the real thing, so don’t use pricing as your only determination. There are plenty of buyers out there who seek out genuine Native American jewelry, so be skeptical if a seller is advertising bargain prices for authentic jewelry. There is probably a reason. If a seller is offering many similar pieces, there is a chance that they may be mass-produced overseas. Some retailers do represent specific artists, so it is possible that they may have multiple similar pieces. However, if each piece looks virtually the same, it was probably produced by machinery using man-made materials. In the world of Native American jewelry, variety is the spice of life. A trusted seller will usually have a variety of one-of-a-kind pieces, rather than an endless supply of clones. If you are interested in adding some Native American flair to your jewelry collection, you may be tempted by low prices. The problem is that when you buy genuine Native American jewelry, you are not just paying for the name. The difference in quality, craftsmanship, beauty, and overall quality is not even comparable. Genuine Native American jewelry also retains its value, whereas counterfeits are essentially worthless. Most importantly, however, is that it is so important to support authentic Native American culture. These artists have dedicated their lives to jewelry making, and they don’t deserve to have their work undermined by shady sellers looking to make a quick buck. At the end of the day, the only way to be 100% sure that what you are buying is authentic is to do business with reputable dealers. Some quick research online should reveal whether a seller is trustworthy, so do the preliminary research before you place your order. Contact the trader before you spend a penny, and ask them about the artists/tribes, and specifics about the piece and where it was sourced. If the trader does not seem knowledgeable, move on. Carolyn Clarke is a freelance writer from Tucson, AZ. She proudly contributes content to a wealth of high-end jewelry providers like Southwest Silver Gallery and is currently working on starting her own jewelry line using organic materials that she finds while roaming the desert. Carolyn’s other hobbies and passions include running, bicycling, and horticulture.